anyone ever try the lens regain with an MFT to E mount adapter for APSC sony's? i'm guessing since MFT is a hair smaller than super35, u'll get some vignetting? Scratch my last question. I didn't realize Aputure's electronic ND filter is a focal reducer as well. Thanks. Can Aputure's electronic variable ND filter work in tandem with a Metabones Speedbooster? @Gerard Puigmal - This adapter does not support Auto Focus. It has to be controlled through a remote. @Chris K. - The only thing I notice is with my 'less quality' lenses that are already soft wide open. Once this focal reducer is mounted you get an extra stop and the image wide open gets even more soft. But when you stop down a bit, it's super sharp. Not a bad thing as you end up getting a wider field of view. If I put a good quality lens on that is sharp at it's widest, then it will still be sharp with the adapter. So there's definitely going to be some favorite lenses to use with the adapter. I'll try to get a video up with it in use on one of our gimbals as that's where the product is really really helpful. Hey Em, can you update us on how the Aputure DEC is performing, particularly with regards to image quality? Does it significantly soften images? (Some comparisons of stills and short vids would be interesting.) I'm guessing for 4k out of the GH4, this will be perfectly fine and any softening is insignificant when you're talking about pixel binning. How well does this adapter do shooting stills? 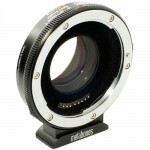 Im debating on getting this or the metabones. Also, thank you for video demos! Please can somebody mail them a picture of what a remote follow focus looks like. It has a twiddly knob that you turn to change focus not a rocker taken out of a 1995 jvc handycam. When they do that we will all take them seriously. Is this what finally became of the DEC Pro that all but vanished? The new version of the Aputure DEC looks promising, and the chart tests suggest it is as good, if not slightly sharper than the Metabones. What's not to like? I have the first version DEC, and it works pretty well. The remote sometimes looses signal and I have to reboot, so I hope the new version is better. The new configuration will make mounting much easier. Aputure is making some great products. The follow focus version with regain is only $500? If so, that's a steal. Looks good Emm. I wonder if you can use it without power, i.e. if you hadn't charged it the night before, or during a long shoot, the power runs out. 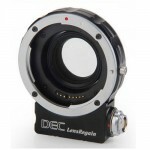 Obviously, the Follow Focus wouldn't work, but as it's a lens, it may just work without aperture control? Thanks for posting! Looks good so far, can't wait to hear your thoughts on it after NAB.